I love a slogan t shirt. Although I have got a lot more picky about what they say since I’ve had kids. I not longer can wear my “I’m a f###ing ray of sunshine” t shirt as it’s not language I want my kids to read over their Shreddies. I also don’t like the beauty orientated messages for girls or the trouble maker slogans for boys. Why boost the negative behaviour? What I did find whilst browsing last week, was this t shirt from River Island Kids. It’s merchandised in the girls section I think due to shape but the styling is bold and the font on point. The message, Future Leader, I love and is totally Unisex. These were flying out the door when we were in store at the end of last week and selected sizes are available online. G’s size was not available but I may stash as this is a message I want people to read. Available from 0-3 mths up to 4-5 years. £8 see hyperlink in text for link and image taken from River Island. 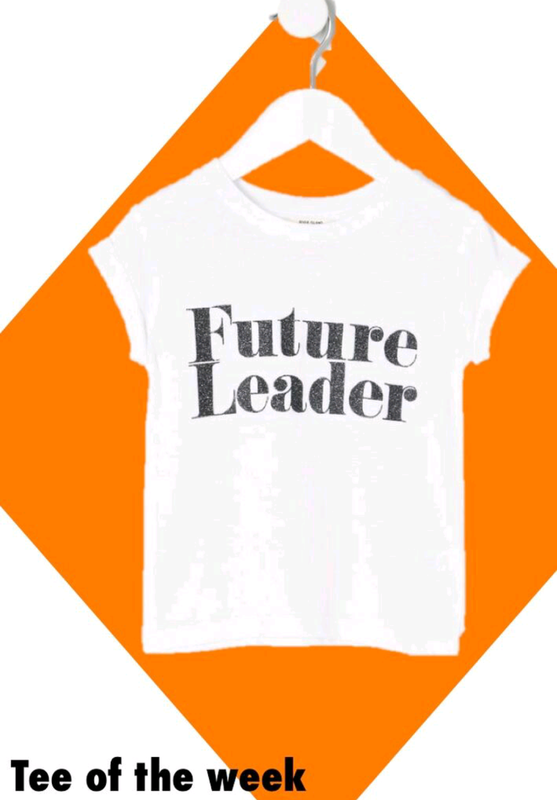 Future Leader tee from River Island. Image from River Island £8. Limited sizes available in store and online. ← In-Gearing up the kids wardrobe for Autumn: T.